Mixvibes' Remixlive gets an update that introduces new features such as Inter-App, Audiobus, SoundCloud export & Retrigger mode. Mixvibes presents Remixlive, a brand new iOS app built for live remixing. JamOrigin's MIDI Guitar 2 for iOS was just released on the App Store. MixVibes has released new versions of their free and Pro/HD Cross DJ mixing apps for iOS & Android. The new Rës is here! New version features more mics, reviewed and better descriptions, French and English languages, search mics function, less bugs and improved UI. IK Multimedia has released Riff Maestro, a free mobile app which they describe as "a guitar teacher in your pocket". Los Rebellos is a young French and British company that debuts with an iOS app that provides information about over 90 microphones. 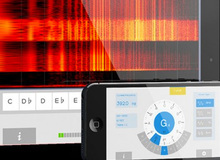 The Audiobus development team has launched a new app that allows you to see and control the Audiobus mapping settings on a second iPhone or iPad.